For some cyclists, riding their bikes in the summer months once the sun has gone down is the most preferred time to ride. Other bike riders who set out on full day bicycle journeys often find themselves in the dusk or dark on their way home. The point is that, as cyclists, we all may find ourselves riding our bikes at night at some point in our lives. With that being said, it is important to know the law in Indiana regarding riding bicycles at night. Sure, this will prevent you from getting a ticket from local law enforcement agencies, but following Indiana’s bicycle laws will also protect you from increased danger. At night, drivers have a more difficult time seeing what is on the road, especially if it is not lit up and not directly in front of their headlights. Even though Indiana bicycle users can ride their bicycles at any time of the day/night, the Indiana legislature enacted IC 9-21-11-9 to make this experience safer. This statute provides that anyone riding a bicycle at night must have a white light on the front of the bike and a red light or red reflector on the back of the bike from ½ hour after sunset to ½ hour before sunrise. This law also provides that these lights and/or the reflector must be visible from a distance of at least 500 feet. It is important to note that the reflectors and lights that came for free with the purchase of your bike may not be sufficient. Many of the lights and reflectors that are included with a store-bought bicycle cannot be seen from 500 feet away, so be sure to test it out before riding at night. Also, keep in mind that the guidelines laid out by the State of Indiana represent the minimum amount of safety measures that must be taken to be legal. The Indiana Bicycle Accident Lawyers at Caress Law Group encourage you to take additional precautions when riding your bicycle at night, including wearing reflective clothing and/or additional lights and reflectors on elbow pads, shoes, and helmets. It is well worth it to buy an extra light for your bike instead of being in the hospital because a driver couldn’t see you at night. 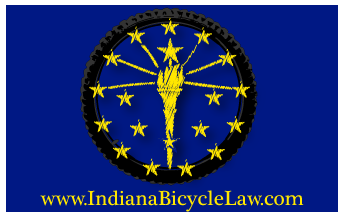 The Indiana Bicycle Lawyers at Caress Law Group applaud the State of Indiana in enacting this law protecting cyclists, and will continue to advocate for Indiana bicycle safety to keep Hoosier cyclists free from harm. Please feel free to contact the experienced bicycle accident attorneys at Caress Law Group if you have any questions regarding this post or if we can help you in any other way. Good news is headed to Circle City cyclists, as Indianapolis recently announced its plan to enhance its bike lanes throughout the city’s roadways through the use of Bike Boxes. Bike Boxes are a designated area at the beginning of a traffic lane at a signaled intersection that provide bicyclists with a safe and visible way to turn ahead of stalled traffic at red traffic lights. If a traffic signal is green, bicyclists use the bike lane as they normally would. However, if the traffic signal is red, bicyclists are able to move to the front of vehicular traffic within the Biker Box boundaries. 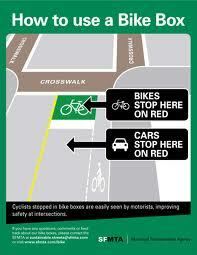 Once the light turns green, cyclists then have the right-of-way to turn either left or right. Once the cyclists have made their turn, vehicle traffic can then proceed. Bike Boxes promote bicycle safety; bicyclists fortunate enough to be in a Bike Box do not need to worry about turning while being surrounded on all sides by motor vehicle traffic. The City of Indianapolis hopes that using Bike Boxes will decrease accidents and collisions involving motor vehicles and bikes. In recent years, Indiana cities and towns like Indianapolis, Carmel, and Fishers, to name a few, have taken action such as this to improve the safety and efficiency of traffic while also promoting the use of bicycles on Indiana streets. Bicycling Hoosiers should be proud of the strong bicycle culture that continues to grow in our state. With new traffic features like Bike Boxes, it becomes even more important to “Share the Road” and be aware of cyclists, pedestrians, runners, and other modes of transportation lawfully using the roadways. The Indianapolis BikeLawyers at Caress Law Group are committed to making sure that bicyclists stay safe. Please pop in regularly at our blog, www.IndianaBicycleLaw.com, for updated information on new bicycle-friendly traffic features and other updates. If you have a question about Indiana personal injury or medical malpractice law, please contact Indianapolis Bicycle Attorney Tim Caress by calling him at 317-255-5400 or emailing him at Tim@CaressLaw.com. All conversations are free. A national bicycle route that runs through Michigan is being planned to extend through the State of Indiana. 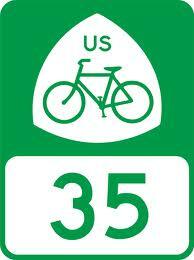 United States Bicycle Route 35 is planned to continue from Michigan to Indiana, beginning in LaPorte County, then down through Indianapolis, and extending all the way down to Louisville. This route is unique in that it will link county roads, current bicycle paths (like the Monon Trail), highways, and city streets. While many counties in Indiana have already approved this route, work is still being done to link up other counties to complete U.S.B.R. 35’s trail that will traverse the entire state. Currently, U.S. Bicycle Route 35 runs nearly 500 miles from New Buffalo, Michigan, (on the border with Indiana) to Sault Sainte Marie, Canada. The long-term plan is for the route to continue south from Indiana all the way down to New Orleans and the Gulf Shores. While bike trails and paths continue to be created in central Indiana, U.S. Bicycle Route 35 presents a compelling opportunity for Hoosiers to venture into many different parts of the state that they may have never before experienced. As bicycle advocates and cyclists themselves, Caress Law Group’s Indiana bicycle lawyers will continue to update readers on this route’s progress, as no timetable or completion date has been released. 1. Seek Medical Attention: Some injuries will be apparent. However, others you may not notice initially and might be worse than they appear. If you are in doubt, it’s always a good idea to call an ambulance or get yourself to the Emergency Room. 2. Contact the Police: It is important that a police report is completed. If no police are called to the scene, be sure to call them yourself or have someone close to you call them. The police report is often a valuable piece of evidence in a bicycle collision claim. 3. Gather Information: Collect any information that you can from the scene of the accident. Get names of those involved in the accident, names of any witnesses, phone numbers, and license plate numbers. 4. 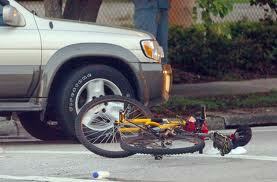 Gather Evidence: Take pictures of the scene of the accident, your bike, the people nearby, and your injuries. Maintain possession of your bicycle if possible. Also, be sure to document your injuries and medical treatment as you recover. 5. Seek Legal Advice: Speak with an attorney who can properly advise you on your best course of action. Caress Law Group’s bicycle accident attorneys provide free consultations and there are no attorney fees unless you recover. Caress Law Group will protect your interests and work for a result that is fair for you. For more information about legal rights and remedies involving bicycle accidents, please contact the Indiana bicycle lawyers at Caress Law Group. We would be honored and privileged to discuss your situation with you to determine how we may be able to help.